These Strawberry Glazed Baked Doughnuts are a fun and romantic Valentine’s Day dessert or breakfast. Baked donuts, not fried, make a healthier and much less messy alternative to traditional glazed doughnuts. No yeast needed for these easy baked doughnuts. Strawberry Glazed Baked Doughnuts are a romantic start to Valentine’s Day or make a great Valentine’s Day dessert, which is right around the corner. Have you made your dinner reservations yet? If not, you can always enjoy a special night in and cook a romantic meal, add dessert, for your special loved one. 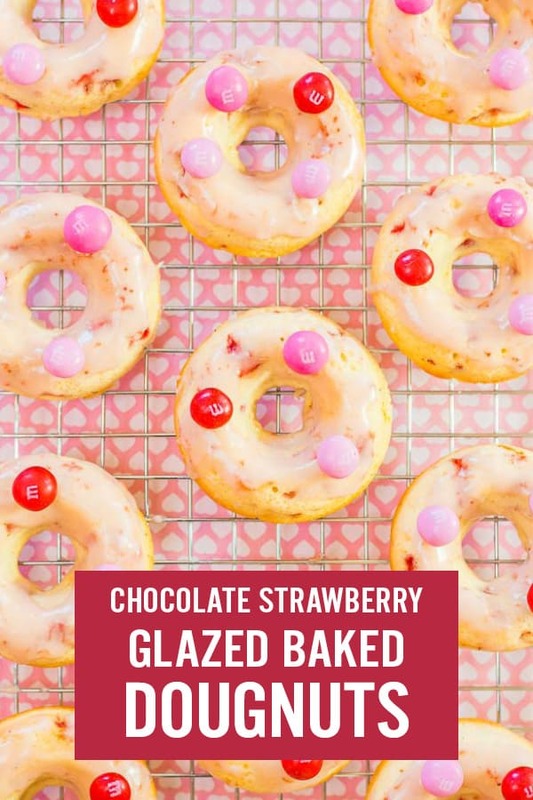 You can start your Valentine’s early with these Chocolate Strawberry Glazed Baked Doughnuts, topped with chocolate peices. That’s right, your breakfast can start with two Valentine’s Day staples, chocolate, and strawberries. Why not bake them into doughnuts, or is it donuts? How is a baked doughnut different from a fried doughnut? Baked doughnuts have a much more cake-like texture rather than a traditional dough-like fried doughnut. The great thing about baked doughnuts is that they are so much healthier and lighter than fried. Plus you can get kids involved in the baking since there’s no hot oil to worry about. 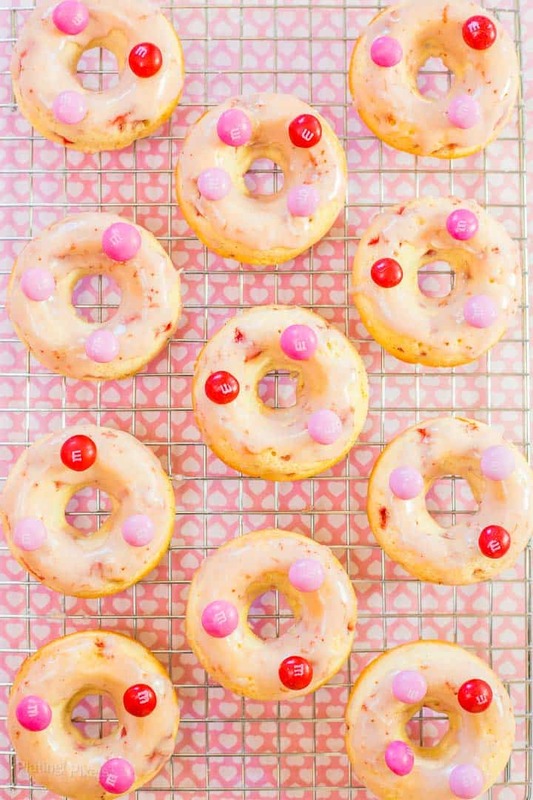 If you’re looking for a doughnut recipe without yeast then these are for you! Unlike fried doughnuts there is no need to add yeast to the batter since the doughnuts use baking powder and eggs to help them rise just like regular cakes, muffins or cupcakes do. In a large bowl combine flour, sugar, nutmeg, and salt. Set aside. Combine almond milk, lemon juice and zest in a separate bowl. Stir in butter and eggs. Whisk liquid into flour mixture until completely combined, then stir in strawberry pieces. Pour batter into a greased donut pan, making sure to not cover center hole. 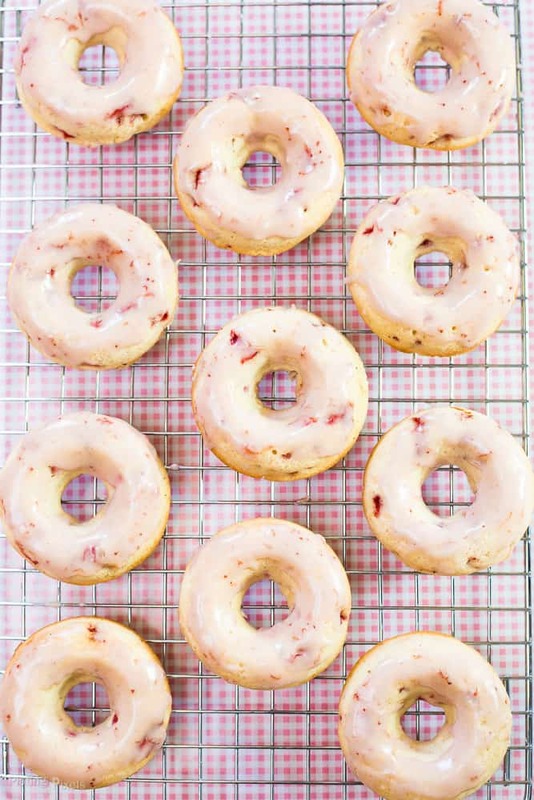 Bake 10 minutes at 425º F until doughnuts have risen and are golden. Cool pan on a wire rack for a few minutes, then remove doughnuts. The glaze uses strawberry jam, powdered sugar, and almond milk. Simply mix all ingredients together while the doughnuts are baking in the oven. The consistency should be thick but easy to spread over the doughnuts. Pro Tip: If your glaze is too thick you can easily adjust the consistency but adding more almond milk or powdered sugar. I prefer to use all-purpose flour and baking powder instead of self-raising flour because you are in control of the rising agent. If you use self-raising flour you may get different results. 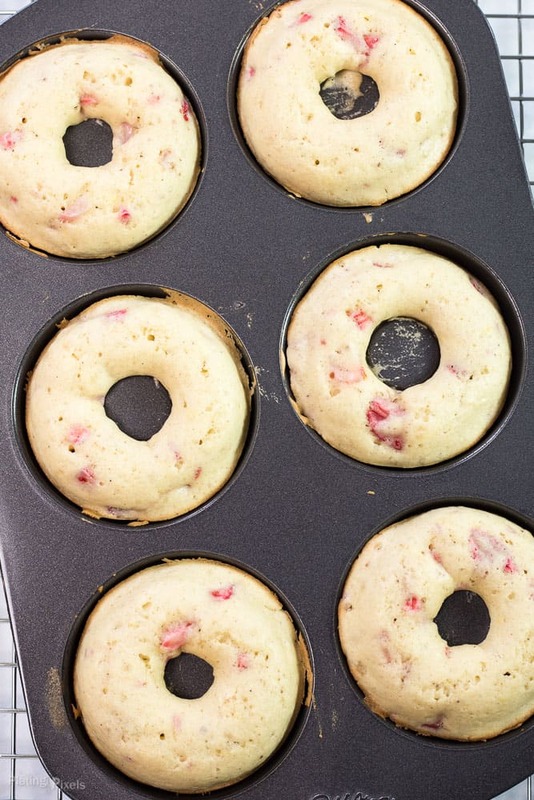 Although these baked doughnuts are made with simple ingredients you do need a doughnut pan to make them so make sure you have one before you start. Even though the doughnut pan looks like half a doughnut, the batter rises to form a perfectly round doughnut shape. Make sure the doughnuts have cooled completely on a cooling rack before spreading the glaze over or it will melt off. Make sure to use large eggs for best results. I topped these with strawberry M&M’s for an extra chocolate strawberry kick but you can top with any Valentine’s inspired sprinkles you like. Store the glazed doughnuts in an airtight container for up to 3 days in the fridge, or freeze for up to 3 months. Flavor profiles: Lots of strawberry with lemon zest, paired with chocolate, which go together so well. Texture: Soft, fluffy and moist with crunchy chocolate toppings. Dietary Options/Substitutions: You could try GF all-purpose flour or substitute some whole wheat flour for a healthier option, but haven’t tried. Chocolate Strawberry Glazed Baked Doughnuts are a romantic Valentine's Day breakfast or dessert. No yeast needed for these easy, no mess baked doughnuts. Preheat oven to 425º F. In a small bowl, combine almond milk, lemon juice, and zest. Stir in butter and eggs. Set aside. In a large bowl combine, flour, sugar, nutmeg, and salt. Pour liquid mixture into flour mixture. 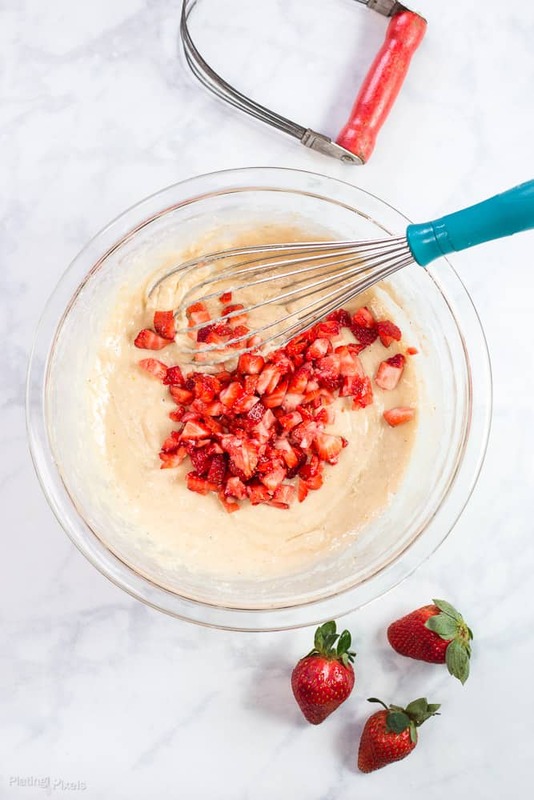 Whisk together until completely combined, then stir in strawberry pieces. Pour batter into a greased donut pan just below the edges, making sure to not cover center hole. Bake 9-10 minutes until cooked and golden. Remove from oven and cool slightly, then transfer doughnuts to a wire rack to cool completely. While doughnuts are baking: In a medium bowl mix together powdered sugar, strawberry preserves, and almond milk. It should be thick, but able to spread easily with a brush. Spread over each baked doughnut then top with desired decorations. Use fresh, ripe strawberries that smell sweet for best flavor. If your glaze is too thick you can easily adjust the consistency but adding more almond milk or powdered sugar. Storage: Store the glazed doughnuts in an airtight container for up to 3 days in the fridge or freeze them for up to 3 months. Hi Stacie. Your local store might have it in baking section, otherwise check the big online retailers. That’s where I ordered mine. You’re welcome and thanks Cara! Oh gosh, these look amazing! Would be such a fun Valentine’s Day breakfast. The kids would go crazy for these! I bet they would. Thanks so much Jenn! These look so perfect they look photo shopped 🙂 YUM! Haha thanks Maris! All original from the camera, besides the usual color and lighting adjustments. These look so perfect for a Valentine’s Day breakfast and I love the M & M topping! Oh wow these look amazing. I would love to wake up to these on Valentine’s day. Thanks Brianne! Hope you have a wonderful one! Those looks so good, perfect for Valentine’s Day. I love that you used almond milk, too. Thanks Becky. I had on hand so used that, it’s adds a subtle flavor too it. Haha I’m sure you’ll do fine Christine. It’s pretty easy with the pan, just be sure to not overfill. That would be a fun treat for them. Thanks Sarah! LOVE baked donuts, and these are interesting – not sure I’ve seen strawberries coupled with M&M’s before, but seriously, why not?! Sounds amazing! It’s a bit unique, but basically chocolate and strawberry, which goes together so well. Thanks Chrisy! This is such a cool idea! It sounds and looks amazing! Great pictures btw! I’m definitely going to try this. I am also a blogger, any advice on how to create a printable as you did for the recipe? Thanks so much Lezley! The background is actually wrapping paper. I use those or printed vinyl (the white marble in other photo is vinyl) in a lot of my photographs (besides linens). You could always keep an eye out for designs you like and trim them down. Oh yum these look SO good! So cute and so creative! Now, only if I can get my boyfriend to make these for me…. Haha that would be a nice Valentine’s gift. Or you could always treat yourself. Thanks Chelsea! I am so gonna try this …maybe to take to the office! Do they stay fresh long…like the next day? Pinned! Hi Elaine. They would stay but I’d recommend keeping them in the fridge since there’s fresh strawberries baked in and jam in the glaze. Thanks! I bought a pan for this and was fun, will have to make more! I’m a fan of strawberries too. Thanks Renee! This recipe sounds soooo good! I might have to try it…who am I kidding, I’m going to try it! I love donuts and I’m obsessed with anything lemon! Sooo good! Lemon and zest is awesome for cooking. Hope you enjoy Cristin! Yummy, those look sooooo dang good! They sure are! Thanks Angie! That’s what I was going for. Thanks Chelsea! These look so delicious! I love that they’re baked and not fried. It’s healthier and easier. Thanks Lisa! So pretty + such a fun idea! A fun treat for this time of the year. It sure is. Thanks so much Emily! I’m such a sucker for strawberry. These look so good! Me too but don’t buy them often enough. Thanks Becky! These are so pretty! So perfect for Valentine’s Day! It’s a good thing these aren’t in front of me right now because they would probably be devoured. You really can’t go wrong with strawberry and chocolate – especially for Valentine’s Day! Wow, these look absolutely delicious, and so perfect for Valentine’s Day! They sure would be, thanks Esther! I don’t drink almond milk , would almond coffee creamer work. I do use that at times. Hi Billie! I’m sure it would work, or you can even use milk if you’re able too. Thanks!